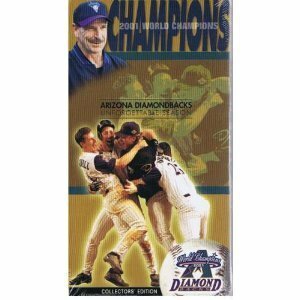 ARIZONA DIAMONDBACKS 2001 World Champions UNFORGETABLE SEASON The 2001 Arizona Diamondbacks battled their way to a world championship for the first time in their history. Before Luis Gonzalez's soft flare landed in shallow left field to scoe the game-winning run in Game 7 of the World Series, the Arizona Diamondbacks season was filled with memorable twists and turns, the kind that will be remembered for years. Led by the incredible pitching duo of Randy Johnson and Curt Schilling, the Diamondbacks won an incredible World Series victory to cap an unforgettable season. See the highlights of this great Diamnodbacks season and much, much more.